1905; 114 years ago (1905), in Chicago, Illinois, U.S.
Marsh & McLennan Companies, Inc. is a global professional services firm, headquartered in New York City with businesses in insurance brokerage, risk management, reinsurance services, talent management, investment advisory, and management consulting. Its four main operating companies are Marsh, Mercer, Oliver Wyman Group, and Guy Carpenter. Marsh & McLennan Companies ranked #212 on the 2018 Fortune 500 ranking, the company's 24th year on the annual Fortune list, and #458 on the 2017 Forbes Global 2000 List. Marsh & McLennan's 2016 revenue of $13.2 billion ranked it #1 on Business Insurance's ranking of the world's largest insurance brokers. Burroughs, Marsh & McLennan was formed by Henry W. Marsh and Donald R. McLennan in Chicago in 1905. It was renamed as Marsh & McLennan in 1906. The reinsurance firm Guy Carpenter & Company was acquired in 1923, a year after it was founded by Guy Carpenter. In 1959, it acquired the human resources consulting firm Mercer. The 1960s were particularly notable for the company's development, including an initial public offering in 1962 and a 1969 reorganization that introduced a holding company configuration, with the company offering clients its services under the banners of separately managed companies. In 1970, the company purchased Putnam Investments, adding a mutual fund business to its portfolio (and sold it in 2007). In 1997, the company significantly boosted its insurance brokerage business with a $1.8 billion acquisition of Johnson & Higgins, which, at the time, was one of MMC’s biggest competitors in its brokerage business. The purchase occurred during a time of consolidation in the industry, and pushed Marsh & McLennan back above Aon as the world’s largest insurance broker. In 2000, Marsh & McLennan’s HR consulting unit, Mercer, acquired Delta Consulting Group for its organizational development and change management expertise. In 2003, the company acquired Oliver Wyman, a management consultancy with a large financial services industry clientele. The Oliver Wyman acquisition served to transform MMC from a company known mostly for its insurance brokerage services into one with a full-fledged management consulting practice that competes with McKinsey, Boston Consulting Group, and others. In 2007, Marsh & McLennan sold its Putnam Investments mutual fund business to Power Financial Corp. for $3.9 billion in a divestment meant to focus the parent company on its risk and human capital businesses. Also in 2007, the company announced that its insurance brokerage unit, Marsh, had received the first license for a wholly owned foreign company to operate an insurance brokerage business in China. In 2010, the company sold Kroll, its corporate intelligence and investigative unit, to Altegrity Inc. for $1.13 billion. Prior to this final deal and divestiture, Marsh & McLennan had been selling off smaller divisions within Kroll to further focus on its core risk and consulting businesses. In July 2017, Marsh & McLennan Cos. Inc. was ranked first in Business Insurance's world's largest brokers list. In 2004, Marsh, the company's insurance brokerage unit, was embroiled in a bid rigging scandal that plagued much of the insurance industry, including brokerage rivals Aon and Willis Group, and insurer AIG. In a lawsuit, Eliot Spitzer, then New York State’s attorney general, accused Marsh of not serving as an unbiased broker, leading to increased costs for clients and higher revenues for Marsh. In early 2005, Marsh agreed to pay $850 million to settle the lawsuit and compensate clients whose commercial insurance it arranged from 2001 to 2004. Much of Marsh & McLennan's corporate strategy since 2005 stemmed from an effort to recover from this tumultuous period, eventually leading to the firm's current organization and simplified focus on insurance services and consulting. At the time of the 2001 September 11 attacks in the United States, the corporation held offices on eight floors, 93 to 100, of the North Tower of the World Trade Center. 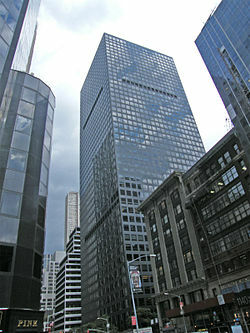 When American Airlines Flight 11 crashed into the building, its offices spanned the entire impact zone, floors 93 to 99. Everybody present in the company's offices on the day of the attack died as all stairwells at impact zone were destroyed or blocked by the crash; the firm lost 295 employees and 66 contractors. Marsh & McLennan Companies is composed of two primary business segments: Risk and Insurance Services, and Consulting. Marsh, which provides insurance broking and risk management consulting. John Doyle has been the president and CEO since 2017. ^ a b c d "Milestones of Marsh & McLennan Companies". Retrieved 2011-08-27. ^ "US SEC: Form 10-K Marsh & McLennan Companies, Inc". U.S. Securities and Exchange Commission. Retrieved March 7, 2018. ^ "MMC Profile - Marsh & McLennan Companies, Inc". Yahoo Finance. Yahoo. Retrieved 6 May 2016. ^ "MMC - Form 10-K, 2016". SEC.gov. Securities and Exchange Commission. Retrieved 24 August 2017. ^ "Marsh & McLennan". Fortune. Retrieved 2018-11-23. ^ "Forbes Global 2000 List". Forbes. Integrated Whale Media. Retrieved 24 August 2017. ^ a b Gonzalez, Gloria. "Top insurance brokers, No. 1: Marsh & McLennan Cos. Inc". Business Insurance (03 Jul 2017). Retrieved 24 August 2017. ^ a b St. James Press (2002). "History of Marsh & McLennan Companies, Inc". International Directory of Company Histories. 45. Retrieved 28 December 2017. ^ a b Ian McDonald (29 December 2006). "Marsh Is Hoping Sale of Putnam Buries Its Woes". Retrieved 28 December 2017. ^ Steven Lipin; Leslie Scism (12 March 1997). "Marsh to Buy Rival Johnson & Higgins". Wall Street Journal. Retrieved 28 December 2017. ^ Leslie Scism (13 March 1997). "Marsh & McLennan Shares Rise On Agreement to Acquire Rival". wsj.com. Retrieved 28 December 2017. ^ Woolsey, Christine (25 March 2000). "Mercer Consulting Group Plans Acquisition of Delta Consulting". HR Hub. Retrieved 28 December 2017. ^ Avery, Helen (26 February 2003). "Mercer confirms Oliver Wyman buy". Investments & Pensions Europe. Retrieved 28 December 2017. ^ James Areddy (23 January 2007). "Marsh Gets License in China to Work as Insurance Broker". Wall Street Journal. Retrieved 28 December 2017. ^ Peter Lattman; Anupreeta Das (8 June 2010). "Marsh & McLennan Sells Kroll for $1.13 Billion". Wall Street Journal. Retrieved 28 December 2017. ^ Treaster, Joseph (24 April 2004). "Insurance Investigations Under Way Over Fees". New York Times (24 April 2004). Retrieved 28 December 2017. ^ Treaster, Joseph (1 Feb 2005). "Insurance Broker Settles Spitzer Suit for $850 Million". New York Times (1 Feb 2005). Retrieved 1 July 2016. ^ Pleven, Liam (8 July 2008). "Marsh on Cusp of Outcomes Crucial to Broker's Future". Wall Street Journal. Retrieved 28 December 2017. ^ "Special Report: WTC Tenant Relocation Summary". TenantWise. September 2003. ^ Dwyer, Jim and Flynn, Kevin, 102 Minutes: The Untold Story of the Fight to Survive Inside the Twin Towers, Times Books, 2006, p. 19. ^ "Marsh & McLennan Companies 2015 Annual Report". SEC.gov. SEC. Retrieved 6 May 2016. This page was last edited on 19 April 2019, at 23:02 (UTC).